Life was unbearable in our country but we hope that we are beginning a new era. I am going to use the Basic Life support (BLS) model to analyse our situation. The first step in BLS is to make sure that it is safe to approach the victim who would have collapsed or injured. It is unwise to approach a person that is contaminated with a chemical that can end up killing you. In any situation make sure that your health is safe before you try to help anyone. You may want to call for specialists to decontaminate the victim before you can offer your help. 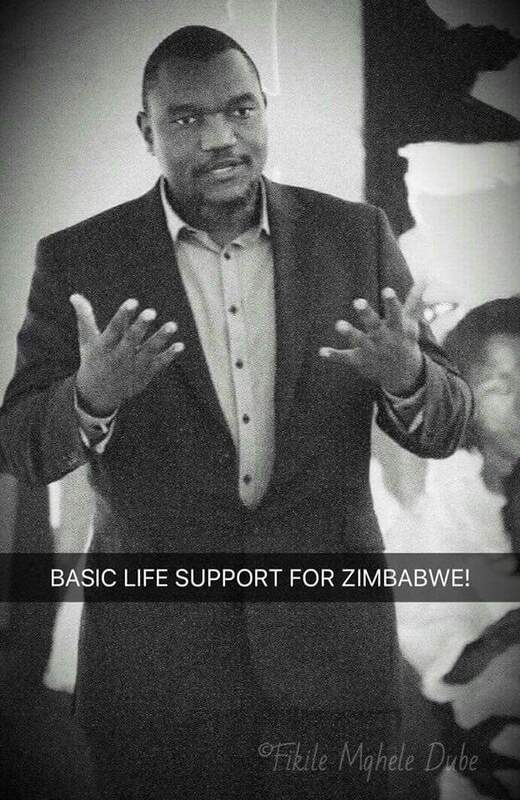 We all could see that Zimbabwe needed help but we had to remember the first rule of Basic Life Support (BLS) is to make sure that it is safe to approach. So many lives were lost as they approached when it was not safe to do so! The Zimbabwe Defence Forces came to our rescue and made it safe for us to approach. When it is now safe to approach we assess the unresponsive victim to determine if they are breathing normally. If they are not breathing normally we call for help. When applying BLS the team leader is important and there is no need to antagonise the Team leader. We were aware of that so we supported the ZDF. When the ZDF moved in and it was safe to approach, we asked our former President who is now a Resident of Zinbabwe to resign but he did not want to do the honourable thing. There was no response from him. We had to call on every Zimbabwean to march in solidarity with the defence forces calling on Mugabe to peacefully go. In BLS when the victim is unresponsive and not breathing well, we dial emergency number and ask for an ambulance. We start Cardiopulomary resuscitation (CPR) if we are trained and able to do so. We combine chest compressions and rescue breaths, otherwise we provide chest compressions only CPR. There is no need to waste time arguing about whether we should do chest compressions only or both compressions and rescue breath. Ideally we need to do both but we should not waste time trying to decide what to do. We marched in our thousands to say enough is enough we want Mugabe to go as he was the "accountable officer" for our suffering. In the process we started to analyse how we were going to get him to resign and pave way for a new Zimbabwe. Some misguided people thought it was a ZANU issue which should be solved by ZANU only. They forgot that if ZANU catches a cold we all sneeze as it is the ruling party. Analysis paralysis would have affected this process resulting in no action but Zimbabweans rose above party politics. An inclusive approach was implemented involving ZANU, The Army, The Opposition and all the people of Zimbabwe. In BLS we do not stop CPR until the victim recovers and is breathing normally or when told by a health professional that the victim is dead. Sometimes we stop because we are tired and the ambulance has not arrived. That is why it is vital that whilst we are helping the victim someone must call for an ambulance. This is a teamwork approach and cannot be successfully done by a single person. If the patient starts to breath then we may stop resuscitation but that is not the end of the story, the victim still needs to go to hospital for further assessment and treatment. When the ambulance arrives they take over the operation and take the victim to the hospital. All the people that would have helped do not need to go to hospital or get into the ambulance. The victim and possibly next of kin will go with the ambulance. Time is of the essence so every second count otherwise the victim will die. Zimbabweans, Mugabe has gone. We did not stop until he resigned. We combined all our efforts to get the resignation but it does not end here. In BLS the victim must be taken to the hospital. Now Zimbabwe needs further assessment for it to make a full recovery. Just as the victim may need surgeons, physicians, nurses etc to work together for a complete recovery, Zimbabwe is no different. Zimbabwe needs an inclusive approach as our economy is down, health system is collapsed, we have high unemployment rate, corruption is rife, and our mindsets need reorientation. This cannot be achieved by one political party. This can only be achieved by genuinely involving all the stakeholders on non-partisan lines. Zimbabweans the doctor has spoken. We need the basic life support to kick start our Zimbabwe. The time is now and no need for procrastination. We are in this together. Let's register to vote and call for a level playing field for our politicians to tell us their well thought policies so that we can make informed decisions as we vote. We thank our defence forces for making it safe to approach, they can now go back to their strategic positions as we take the country back to the people! When the patient is now at the Hospital the Multidisciplinary Team treating the patient also has a Team leader coordinating treatment. This how ED Munangagwa has to lead that process. Team leaders are not necessarily the smartest or the holiest but they must be able to lead, be inclusive, follow procedure, have self-awareness and delegate appropriately. Lest we forget, we must also carry out a medical audit of how the victim became unresponsive or what caused the collapse. The audit will help our nation to learn from our mistakes. Never again shall one person rule us for 37 years!